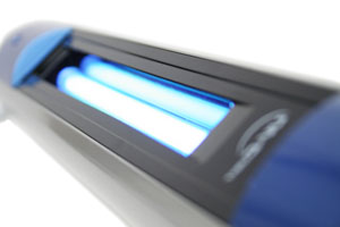 UV-C light is a scientifically proven efficient way of cleansing surfaces of bacteria and viruses by damaging their DNA. It is now being used by Mum’s Helping Hands Cleaning Service to kill off dust mites and bacteria wherever they might be. This method is safe, chemical free and dry, and only uses shortwave radiation in the form of ultraviolet light, which is lethal to bacteria, viruses, dust mites, and other micro organisms. UV-C is a fantastic new addition to our process due to how cost -effective safe, fast and efficient it is. Who could benefit from UV-C technology? Hotels and Guest Houses: With the ever increasing publicity in the national press, television and radio regarding allergy related health problems and the consequent demand for hypoallergenic accommodation solutions, this is an opportunity for you to attract the 40% of the population (including 85% of asthma sufferers) who suffer from allergy related health problems. We can create Allergy Friendly Rooms for you using our unique methods, and we can even inform your staff on how to offer and describe the option of the hypoallergenic bedroom in order to maximise bookings and your additional profits. The service is provided by specially trained mattress cleaning operatives using our equipment (which includes ultraviolet technology) on mattresses, duvets, pillows, bed covers, curtains, carpets and other soft furnishings in a bedroom, thus creating a hypoallergenic environment for your guests. The room is available for use immediately after the process is completed. It is a three stage process, which takes no longer than half a day to complete, and should carried out up to four times a year depending upon occupancy rates. On completion a certificate is provided for each room to display to customers to show that the hotel is making efforts to help allergy sufferers. Nurseries and Play Areas: It’s very important for our children to spend their time in a safe and hygienic environment, so our hypoallergenic sanitisation service for nurseries is made to reduce dust mite and bacteria levels where it really matters. Studies have shown that high exposure to dust mites at a young age increases chances of developing an allergy to them later on in life. The symptoms caused for those already with the allergy (including 85% of asthma sufferers) can be very unpleasant and are ongoing. Our unique cleaning process, which includes ultraviolet technology, can cripple their populations as it involves a number of different steps which each attacks them in a different way. In nurseries we’ll clean carpets, rugs, curtains, stuffed toys, and mattresses, all of which can be havens for dust mites. At the end of the process we will provide each nursery with a certificate for them to display for parents and visitors, showing that they’ve made efforts to reduce dust mite levels. Offices and Surgeries: At Mum’s Helping Hands,we believe it’s important to promote good hygiene in the workplace which can save your business money. Good IT and telephone hygiene will help your business to improve your Health and Safety aims by: preventing sickness, reducing absenteeism, potential litigation and equipment expenditure. Research has shown that keyboards and telephones can harbour incredible amounts of bacteria and viruses, up to 400 times the levels as a toilet seat. This could include MRSA, Influenza, E-Coli, Salmonella, C-Difficile and many other common microbiological threats. Mum’s Helping Hands offer monthly and quarterly contract specialist services including; Surface cleaning of any office appliances, computer, screens, keyboards, mice, telephones, printer/fax machines, scanners and photocopiers, laptops patient call systems, children’s toy boxes and patient treatment tables.